U. WASHINGTON-SEATTLE (US) — Gamers have solved the structure of a retrovirus enzyme whose configuration had stumped scientists for more than a decade. The gamers achieved their discovery by playing Foldit, an online game that allows players to collaborate and compete in predicting the structure of protein molecules. “We wanted to see if human intuition could succeed where automated methods had failed,” says Firas Khatib, a researcher in the protein structure lab of David Baker, professor of biochemistry at the University of Washington. Remarkably, the gamers generated models good enough for the researchers to refine and, within a few days, determine the enzyme’s structure. Equally amazing, surfaces on the molecule stood out as likely targets for drugs to deactivate the enzyme. “These features provide exciting opportunities for the design of retroviral drugs, including AIDS drugs,” wrote the authors of a paper published this month in Nature Structural & Molecular Biology. The scientists and gamers are listed as co-authors. Foldit was created by computer scientists at the UW Center for Game Science in collaboration with the Baker lab. Players come from all walks of life. The game taps into their 3-D spatial abilities to rotate chains of amino acids in cyberspace. 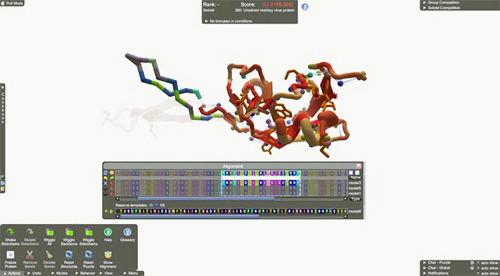 Direct manipulation tools, as well as assistance from a computer program called Rosetta, encourage participants to configure graphics into a workable protein model. Teams send in their answers, and researchers constantly improve the design of the game and its puzzles by analyzing the players’ problem-solving strategies. Figuring out the shape and misshape of proteins contributes to research on causes of and cures for cancer, Alzheimer’s, immune deficiencies, and a host of other disorders, as well as to environmental work on biofuels. The researchers note that much attention has been given to the possibilities of crowd-sourcing and game playing in scientific discovery. Their results indicate the potential for integrating online video games into real-world science. Games like Foldit are evolving. To piece together the retrovirus enzyme structure, Cooper says, gamers used a new Alignment Tool for the first time to copy parts of known molecules and test their fit in an incomplete model.